You’ve got the wide open vistas of sagebrush plains with the mountains behind, that always makes me think New Mexico could be named “Big Sky Country”, too. You’ve got the spectacular Rio Grande Gorge, with the mighty river swirling and tumbling over rapids far below. You’ve got the confluence of the Rio Grande and the Red River, joining forces to create an even wilder river. You’ve got campsites right at the top of the gorge, with a precipitous view into the depths just steps from your tent. You’ve got hiking trails that take you down to splendid riverside spots, where you can relax in the shade of ponderosa pines, or do some fishing if that’s your thing. If that’s not enough, you can also search out the ancient petroglyphs that bear witness to the popularity of this spot in bygone days. Yes, Wild Rivers has it all! 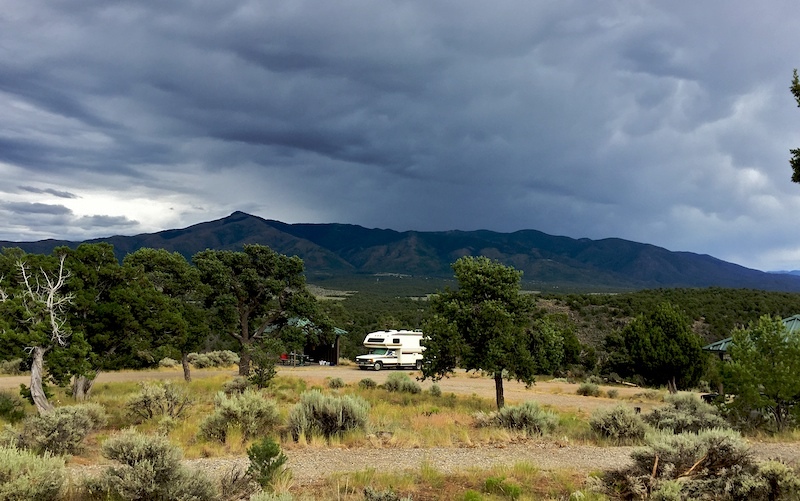 This superb spot is about an hour north of Taos, New Mexico, and lies west of the little town of Questa. The main area for camping and hiking is on a mesa in between two deep river canyons – the Rio Grande on the west side, and the Red River on the east. The mesa narrows to a point, above the confluence of the two rivers. What’s with the two names? This place is amazing, and well deserves the additional level of attention and protection that it should get as a national monument. In any case, you may see this listed on maps or phone navigation under either name, so if you don’t find one name, check for the other. I was wondering why Siri couldn’t find the name I was asking for! There are several different campgrounds heres. A few are on the west side, overlooking the Rio Grande Gorge. One campground is on the east side, overlooking the Red River, and one is near the confluence, above the point where the rivers meet. 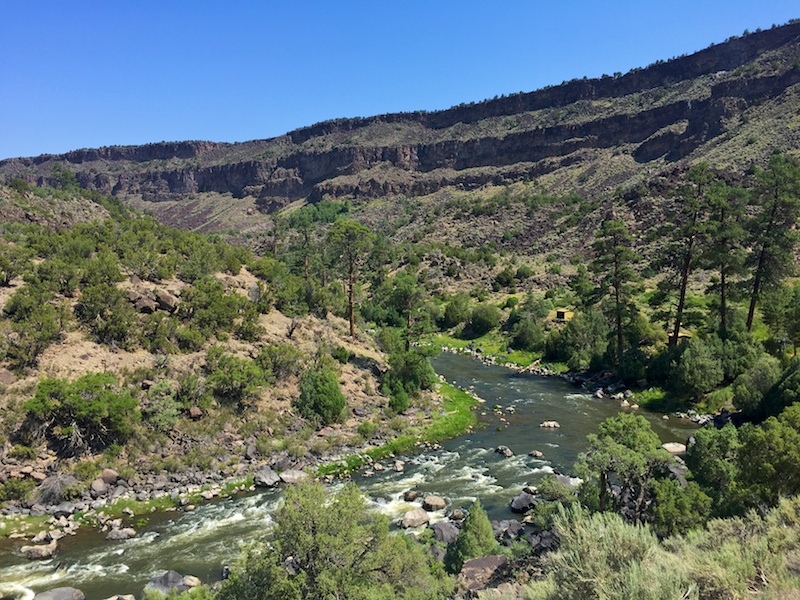 One time I got site #5 at Big Arsenic campground, with super views both directions along the Rio Grande Gorge. The river was far below, but you could hear its rushing water from camp. This is close to another site, but since there was nobody there, it was perfect! Site #9 at Big Arsenic looks absolutely stellar, but it’s been taken when I’ve camped here. Camped at El Aguaje. The Red River canyon is directly behind my spot. Not all of the campsites are this close to the rim of the canyons, so it pays to drive around and check different campgrounds and sites until you find one you really like. The campgrounds are in good shape, with shade structures, picnic tables, fire rings, grills, well-maintained pit toilets, drinking water, garbage service, and recycling (at selected locations). If you’re looking for big pull-through campsites with full hookups, then you’re not going to find those here. 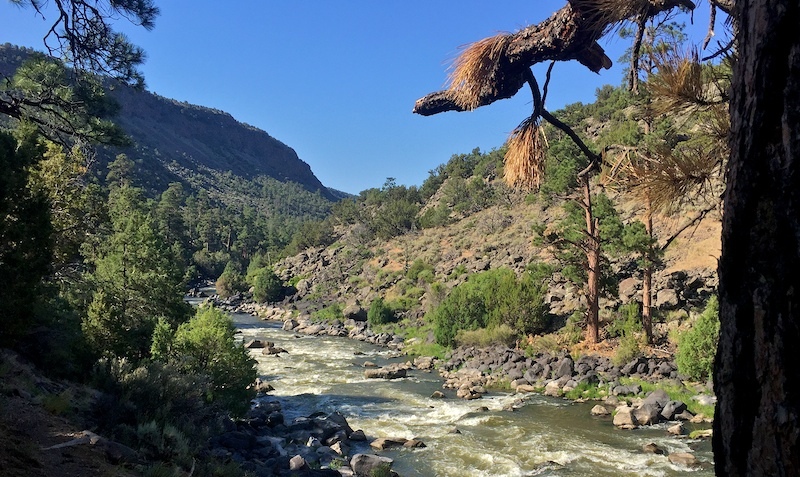 But the nearby town of Questa could accommodate you if you want to park your RV there, and hike around Wild Rivers for the day. And a bonus… I even had good T-Mobile cell phone reception here – better than in some parts of Taos! The campgrounds were far from full when I was here on summer weekdays, but your results may vary, especially if you’re trying for something like a holiday weekend. For $7/night, this is a bargain, and I’m happy to support such a fabulous place. If you’ve got the energy to make the climb back out of the gorge, then the hikes that head down into the canyons are definitely the way to go. It’s a bit of a workout on the way back up, but oh so worth it! The canyon is an “inverted ecosystem“, in that as you go down into the canyon, you find the plants which you normally would see when you head up into the mountains. At the top on the mesa, it’s all sagebrush and pinon-juniper woodland. As you descend into the shadier reaches of the canyons, you find large ponderosa pines, and even douglas firs. At the floor of the canyon, the trail winds along the river, giving you numerous photo ops. There are springs, rapids, calm pools, and ever-changing vistas of the canyon walls above you. The riverside trail connects with several of the trails that come down from the top, so that you can travel down one trail and up another, and make a big loop hike out of it. 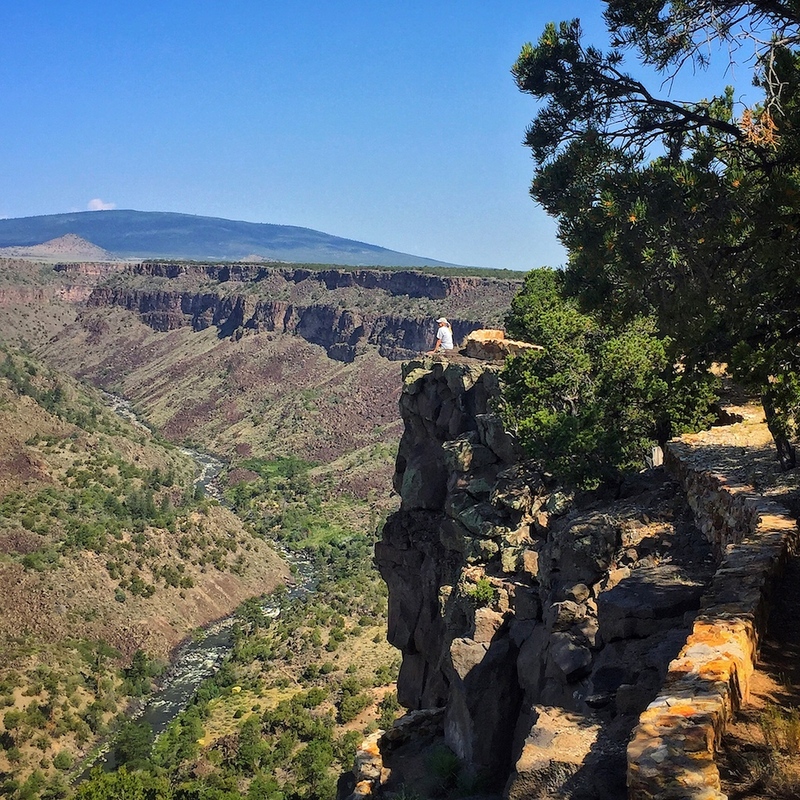 If looking down into the gorge makes you feel like you don’t want to tackle the climb back up from the river’s edge, there’s a 6-mile Rinconada Loop trail that winds around the top of the mesa. You can start this at any of the campgrounds, and follow it either direction. 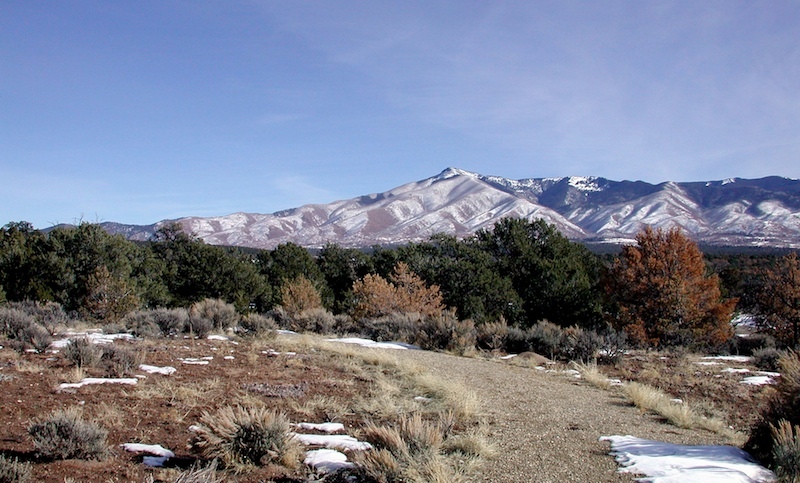 You’ll see sweeping views of the mountains, as well as glimpses into the gorge whenever the trail nears the edge. In between, you’ll wander through sagebrush and juniper. It’s quite a delightful trail, though not as dramatic as descending into the canyon. But what makes these so idyllic is the riverside environment, which is totally different than what you find at the top. You’ve got cool shade during the daytime, and the river running right by your campsite, lulling you to sleep with its soothing wash of sound. I could happily spend a few days just hiking around the canyon, exploring here and there, and relaxing by the river with a book in my down time. I don’t fish, but I bet people who do would think this is heaven. Backpackers can camp by the river, with a view like this! Another thing I’d like to check out sometime is the west side of the Rio Grande. This is part of Rio Grande del Norte too, but it’s not developed like the Wild Rivers area is. The west side would involve wild camping, and discovering your own trails. I’ve heard there are ways to descend into the canyon on that side too, though I don’t have any more details on it. For now, I’ll just say that Wild Rivers / Rio Grande del Norte gets my highest recommendation. If you’re anywhere in the area, be sure to check it out! Official campsites. There are picnic tables, shade structures, fire rings, grills, pit toilets, drinking water, and garbage collection. No hookups. Good cell service. Have you visited Wild Rivers for either hiking or camping? I’d love to hear about your experiences, so please share with us in the Reply section below. Thanks!